The fourth representation of European citizenship emerged in the context of the Constitutional Treaty and the appointment of Margot Wallström as Commissioner for Communication Strategy who began to create a ‘Europe of Agorai’ for European civil-spatial citizens. What this meant was that the European citizen was understood as an intelligent and rational deliberator who is interested in and knowledgeable about European policies and who could (at least in theory) act as a policy-advisor to the European Commission. The European Commission believed that debate and dialogue facilitated by newly built virtual and physical European agorai would give European citizens the real possibility to debate European topics, to voice their own opinions and to gain ‘ownership’ of the European project. CCE (Commission des Communautés Européennes). (2010a). Communicating the constitution. 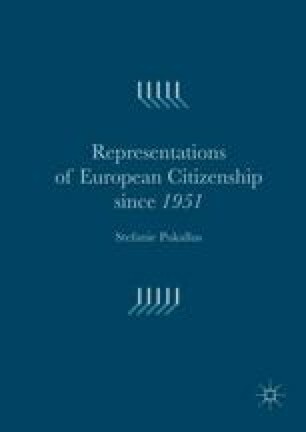 http://ec.europa.eu/archives/commission_2004-2009/wallstrom/pdf/communicating_constitution_en.pdf. Accessed 2 July 2011. CCE (Commission des Communautés Européennes). (2010b). The members of the Barroso Commission (2004–2009). http://ec.europa.eu/archives/commission_2004-2009/index_en.htm. Accessed 14 July 2012. CCE (Commission des Communautés Européennes). (2010c). Margot Wallström, Vice-President of the European Commission—Key documents. http://ec.europa.eu/archives/commission_2004-2009/wallstrom/keydocs_en.htm. Accessed 7 July 2011. CCE (Commission des Communautés Européennes). (2012a). Culture ‘European capital of culture’. http://ec.europa.eu/culture/our-programmes-and-actions/doc413_en.htm. Accessed 12 Jan 2012. CCE (Commission des Communautés Européennes). (2012b). Summaries of EU legislation. http://europa.eu/legislation_summaries/index_en.htm. Accessed 7 July 2011. CVCE. (2012). Declaration by the heads of state or government on the ratification of the treaty establishing a constitution for Europe (Brussels, 16 and 17 June 2005). http://www.cvce.eu/obj/declaration_by_the_heads_of_state_or_government_on_the_ratification_of_the_treaty_establishing_a_constitution_for_europe_brussels_16_and_17_june_2005-en-6f48b533-b2e1-437e-a01b-0d762b593c08.html. Accessed 25 July 2012. Euréval, et al. (2009). Evaluation of the Plan D/Debate Europe citizen consultations projects. Report. http://ec.europa.eu/dgs/communication/about/evaluation/documents/2009-debate-europe_en.pdf. Accessed 15 Jan 2015. European Citizens’ Consultations. (no date a). European citizens’ summit. http://ecc.european-citizens-consultations.eu/74.0.html. Accessed 5 July 2012. European Citizens’ Consultations. (no date b). Project outline. http://www.vitalizing-democracy.org/site/downloads/219_265_ECC_09_Project_Description_final.pdf. Accessed 14 July 2012. Mahony, H. (2009). Wallström: EU needs a commissioner for citizens [sic]. http://euobserver.com/political/28598. Accessed 18 July 2011. Public Participation Case Studies. (no date). European citizens consultation 2009. http://www.peopleandparticipation.net/pages/viewpage.action?pageId=27788161&showChildren=false&decorator=printable. Accessed 14 July 2012. Schlesinger, P. (2003). The Babel of Europe? An essay on networks and communicative spaces (ARENA Working Paper 22/03). http://www.sv.uio.no/arena/english/research/publications/arena-publications/workingpapers/working-papers2003/wp03_22.pdf. Accessed 23 Feb 2010. Waterfield, B. (2006). The messenger and the message. Interview with Margot Wallström. http://www.docstoc.com/docs/967552/The-messenger-and-the-message. Accessed 12 July 2011.